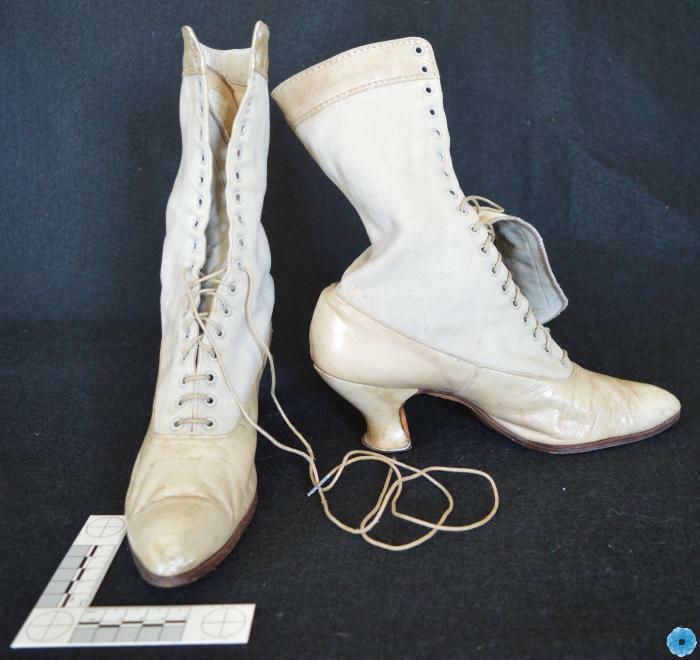 Description: High laced cream leather and fabric woman's boots has a 6.5cm Louis heel, a pointed toe, and a long tongue. There are eighteen pairs of metal eyelets with cotton laces. There is a decorative border around the top of the boot with brogueing around the edges. The shoe parts of the boots are leather and the upper parts are a heavy cotton fabric. The boots are lined with cotton duck. Soles are brown leather with a metal insert on the heels between the sole of the heel and the heel itself. Small areas of wood in heel are beginning to show from wear. See Marks & Labels.